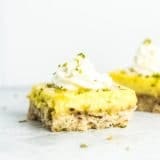 These Coconut Lime Bars feature a coconut shortbread crust, topped with a smooth and tart lime filling. They’re the perfect summer treat! Toast the coconut flakes in a skillet or pan. Cook over medium heat until flakes are golden brown. Set aside in a small bowl to cool. Preheat oven to 350F and grease an 8×8 square baking pan with nonstick spray and/or parchment paper. In a large bowl, whisk together the flour, cooled coconut flakes, and powdered sugar. Add the butter and cut into the flour mixture until coarse lumps have formed. Press shortbread dough onto the bottom of your greased baking pan and bake for 25 minutes, until the edges are just turning brown. In the meantime, add the egg yolks to a medium bowl or the bowl of a stand mixer and whisk for 2 minutes. Add the condensed milk, lime zest, and lime juice and whisk until combined. Pour the lime filling on top of the partially baked crust and place back into oven for 15 minutes, until the filling sets. Transfer the pan to a wire rack and cool for an hour. Then, transfer the pan to the refrigerator and allow to cool for 2 hours. Coconut shortbread crust adapted from Bon Appetit.